New Yorks Interpol reminds anyone who has ever heard post-punk bands like Joy Division and the Chameleons of those exact bands, plus a few more. The roots of the band — as far as its members are considered — can be traced back to a partnership between Daniel Kessler (a guitarist and vocalist) and a fellow New York University student named Greg Drudy (a drummer). Kessler struck up a friendship with another NYU student, Carlos Dengler, who had previously played guitar and felt like becoming involved with music for a second time. He took up the bass and keyboard duties. And by sheer coincidence, Kessler later bumped into Paul Banks, a guitarist/vocalist he knew from time spent in France. 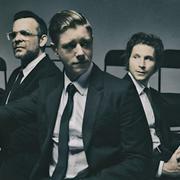 With the lineup settled, Interpol became a fully active band in 1998. After the bands first gigs in early 2000, Drudy vacated his position and was replaced by Sam Fogarino. They started playing out frequently, including regular appearances at clubs in and around New York like Brownies and the Mercury Lounge. A brief tour of the U.K. in April 2001 was punctuated by a radio session for John Peels BBC program; at that point, the band was touring in support of a limited-edition EP released through the Chemikal Underground labels Fukd I.D. series. (They had also appeared on a compilation that was released just prior to Fukd I.D. called Clooney Tunes for another U.K. indie, Fierce Panda.) 2001 also saw a self-released EP from the band and another compilation appearance on Arena Rocks This Is Next Year, a double-disc set of Brooklyn-area acts. Matador signed the band in 2002 and issued a three-song single and the bands debut LP (Turn on the Bright Lights) by years end. The album made the band indie stars, and extensive touring around the world followed. Just prior to releasing their second album (Antics) in September 2004, they opened for the Cure as part of that bands Curiosa Festival. Our Love to Admire, the bands first album for a major label (Capitol), was released in 2007.